Dust mops for quick touch-ups between deep cleans and for picking up pet hair and other dry debris (not for sticky spills or ground-in dirt). Wet mops (spin mops) are better for tougher messes (with control how much moisture to use – important for hardwood floors that can sustain damage if they get too wet). Spray mops – they use built-in cleaners and easy spray controls for the ultimate in convenience. The main feature that catches the eye when you look at this mop from Microfiber Wholesale is the stainless steel handle. The head also has a metallic construction, with aluminum frames. The mop head is connected to the handle using a pivoting plastic joint in bright colors. This is a flat mop, with a generously sized rectangular head that sits flush on the floor. There are two mop pads to choose from, a wet mop and a dust mop variant as well. The main positive feature on this mop is the premium microfiber mop pads used. They are perfect for your hardwood floors. In fact, if you have this mop, you don’t need to use a vacuum or broom to prep the floors! The dust mop pads included with the package can be used to trap all the dust and dirt on the floor. You can then switch to the wet mop pads to remove any sticky mess that remains. This is a pro-grade mop, with a very versatile function ideal for both homes and offices. It works well on a wide range of surfaces, ranging from hardwood to laminate, tiles, and concrete, just to name a few. The six feet long handle provides excellent reach with a telescoping feature. 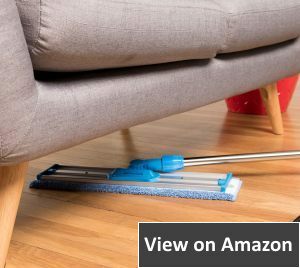 The pivoting joint on the mop head ensures that you can reach spots under the sofa and other furniture with relative ease . The overall build quality also deserves special mention, thanks to the combination of durable stainless steel and aluminum used in this mop. The mop comes with three wet mop pads and two microfiber cloths. You can buy these pads separately from the manufacturer as well. This mop does not come with any other accessories like a bucket or something. While the metal parts work very well, the swiveling/pivoting section is made from plastic, and has some durability concerns. The pads use a Velcro mechanism to attach to the mop head. This feature does not work very well the pads are wet, and it also seems to degrade pretty fast. 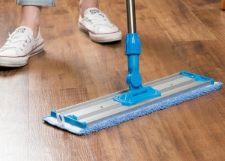 Verdict: This Professional mop is a versatile all-rounder with durable metal construction and a plastic “Achilles’ Heel!” It works well on all kinds of floors and is one of the cheaper options around for a wood floor. The Spinwave is a very sleek and futuristic looking powered floor mop from Bissell. It has a very slim handle that houses a compact storage tank for the water and cleaning solution. The mop head has an oblong shape with two circular spinning pads underneath to clean the floor. The main advantage of the Spinwave is that it saves you from a lot of elbow grease. This is a powered device that you simply have to point in the right direction. The rotating pads at the base do all the hard work. And if you have a wood floor, Bissell has provided soft touch pads made from microfiber designed specifically to protect such floors. For harder laminate and tile surfaces, you can use the more abrasive scrubby pads. The head is connected to the handle at a swiveling joint, which makes it easier to reach under furniture. The device weighs less than 10 lbs, which makes it one of the lightest models in its class and category. There is a convenient spray button located on the top of the handle. This feature allows you to use just the right amount of cleaning liquid when the situation calls for it. You no longer have to worry about endlessly wringing the mop head to remove excess water. The onboard tank is easy to fill, and Bissell even provides a specially designed multi-surface cleaning formula along with some variants of the Spinwave. Since this is a powered device, you will have to plug it into an electrical outlet to use it. The cord is pretty long, so you don’t have to worry about switching outlets too much. You can use any cleaning solution with the mop. Though this mop does a decent job in open areas; the same cannot be said about edges and corners. The mop head has a hard time in covering the corners and tight spaces like the gap behind your toilet. The cloth mop pads also need some improvements to make them more effective. As it is, they sometimes leave dirt streaks and stains behind.It does not work well on very dirty floors. Verdict: The Bissel Spinwave is a very promising product that still needs some improvements to make it more versatile. For hardwood floors in high traffic areas, this is a decent performer. As long as you prep the floor properly, it does an excellent job of cleaning it. But in very dirty tile or laminate surfaces, this mop does a poor job. Buy only if you have a lot of wood floors to clean. 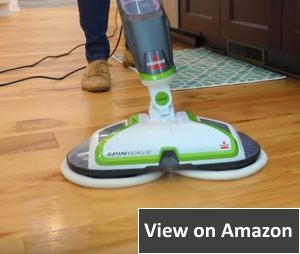 In this video man and his wife demonstrate set up and use the BISSELL Spinwave Powered Hardwood Floor Mop and Cleaner (2039A). They are using it on vinyl floors. She’s taking the first pad locating the dot in the center of the pad and placing that dot over the center of the Bissell Motorhead, this is important to have those two spots lined up because it will make the pads spin evenly without vibrating the machine (it takes a couple tries to get them on there perfectly). She’s going to install the water and cleaning solution container (she’s placed water in it and a certain amount of the Bissell floor cleaner). Their verdict: machine seems to be quiet, easily to push back and forth, the head rotates in many different directions to get into corners. Hint: what she does to apply the cleaning solution: she pushes a button on the on the handle and it squirts out an amount of liquid and from the machine you regulate how much liquid is put out by how long you push the button. The Mopnado is, first of all, a very imaginatively named product. This is a comprehensive mop system, with a specially designed bucket in tow and everything. Decked in visually striking lime green accents, the Mopnado mop and bucket have a combination of plastic and stainless steel construction. This mop has a rolling spin head made from microfiber. The top feature on the Mopnado is the mop head. Made from microfiber, the mop heads are ideal for any floor surface, but do an exceptionally good job on wood floors. They are also easy to clean and maintain since you can just pop them into your dishwasher when they catch all the dirt and grime from your floor. The swiveling head also allows you to clean hard to reach spots underneath your furniture. The 4.6 feet long handle has telescoping capabilities, enabling this mop to be used on vertical surfaces like walls and windows. Another great feature is the easy spinning mop head plates on the Mopnado. By allowing for easier spins, this feature enables you to wring water out of the mop quicker. This means that you can clean wood floors much faster. The deluxe bucket also deserves special mention. It has a stainless steel inner chamber, which is unique among similar products in the market. The bucket has pull handle, carry handle, and wheels, making it one of the most portable mop buckets out there. The built-in spin agitator removes dirt from the mop pads in double quick time. You get two microfiber heads free with the package. The mop bucket has a free cleaning solution dispenser built into it. As with the other mop reviewed by us, the Achilles Heel on the Mopnado is also the plastic joint that connects the mop head to the handle. This is the point that has to absorb a lot of stress. And it is prone to breakage. At some angles, the plastic bit on the mophead tends to scrape at the floor surface, which can be very irritating as well. So you have to be very careful about the angle at which you hold this mop. Verdict: The Mopnado does make your life a lot easier with some innovative features built into the bucket and mop head. But it also has some irritating flaws that can eclipse all those nice features. It does do a good job of cleaning wood floors. 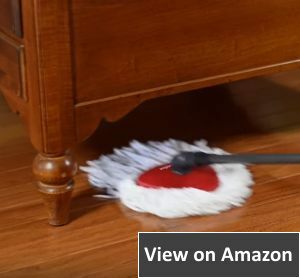 In this video man from PanTheOrganizer youtube channel shows you how to properly wash your hardwood floors with Mopnado Stainless Steel Deluxe Rolling Spin Mop. He shows you some tips and tricks on how to properly clean your hardwood floors but keep in mind that everything also applies to any type of flooring whether it be ceramic tiles, engineered wood, hardwood floors, floating wood and vinyl. So the tools you’re going to need for the job are quite simple: Mopnado, pure white vinegar (this is going to act as a disinfectant), dishwashing liquid (this is a gentle cleaner and degreaser), isopropyl rubbing alcohol (this is going to act both as a disinfectant and help dry out all the liquid that’s going to be on the floor). So as you can tell these are all household items that you probably already have at home very low in cost and super effective (no need to purchase any expensive cleaners). Cleaner mixture First: you’re going to put a bit of vinegar, roughly a capful or maybe more, there is no scientific measuring to this, just don’t worry about it. Then basically a bit of vinegar, add about half a pinky nail of dishwashing liquid, so just a little bit, and add about a capful of isopropyl rubbing alcohol. This mixture work on all your types of floors! Then fill the bucket up with hot water. Now the bucket filled with hot soapy water, let’s go ahead and start mopping the floors. Just dunk the mop in the water and now you got to make sure you strain as much water as you can. Tip: when you’re mopping the floor, make sure you go in the same way as the grain of the wood. Mopnado is the top rated mop I ever came across. First of all the mop head itself is made out of microfibers, these are gentle and will not scratch the surface. The main feature of this mop system is that it uses patented spin-dry technology, what that means is that the dirt is going to stay into the bucket and not onto your floors. You put the mop head into the cleaning tank, the spinning action helps remove all the dirt and spins it into the water, you remove your mop head, you put it into the stainless steel drying tank and your wring the water out. 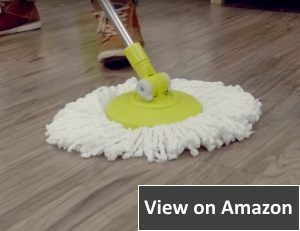 If you buy this mop you’re going to love every minute of using it and with the tips and tricks that I gave you on how to wash your floor’s your place and house should look amazing. In another video, stay-at-home mom and a mom of two kiddos gives a review of the Mopnado, watch it! I feel like constantly cleaning, mopping, sweeping the floors, especially now that I have a ten month old, who thinks it’s fun to put everything in anything that is on the floor in her mouth and the ten month old, who is crying so it’s really important to keep my floors clean and germ free. I always try to have people and make sure that we take our shoes off when we come into our house but as a mom of two kids everyday life my floors to get pretty sticky and dirty and icky and with dust and all that fun stuff it was time for a new mop. The mop that I currently had was a Rubbermaid mop from Target, I want to say it was around like ten dollars maybe and it’s just one of those that you need your own mop bucket you dump it in the water and yeah wring it out and almost kind of blisters the inside of my hand makes my hands really raw and really uncomfortable and it’s just not a fun process and when I’m cleaning not that cleaning is fun but the easier you can make cleaning with good quality products. I’ll going to review Mopnado. It comes with you our handle, with the scrub brush attachment to 2 mop heads, the mop bucket and then my favorite part about this whole thing is the soap dispenser, that goes right into the bucket, which is awesome: there’s no putting soap in your bucket, then filling it up. You can put your water in your bucket and then always have your soap ready to go all you have to do is pump it in. I also love that it seems really a high quality and heavy-duty, so here is what the bucket looks like it’s nice and thick plastic it has this really awesome read like self retractable handle. When you’re riding in with your bucket all you have to do is grab your handle and drag it to where you want to go, there’s no picking up your bucket there’s no like trying to scoot it along with your feet and accidentally spilling your dirty soapy water. The scrub brush attachment which if you have some really tough spots or you need some scrub some sticky spots off of your floor you attach that straight to mop head and you can scrub your floors. I also really love that this center of this drum part where you place the mop to essentially wring it out is a stainless steel and it feels really high-quality, I think other mops like this that this section is just a really flimsy plastic, so I’m really looking how heavy-duty this feels, I feel like it’s gonna last a really long time. And I really love this feature that the handle is kind of self-retracting so you don’t need to worry about putting this back in when you’re done moving it to wherever you need it do. One of my favorite features about the whole mop it spins out so much water more than you ever could just with manually wringing out your mop and it’s perfect for hardwood floors because you don’t have a lot of dry time and you’re not saturating your floors with water. The EasyWring is one of the most looking products in our top four list, with a red and dark grey color combination. This is a very lightweight system, with durable plastic construction. It is also one of the most affordable products of its kind, which is not very surprising since they didn’t use any metal in this one. The cleaning system includes a mop and a bucket with features similar to the Mopnado. The O-Cedar is incredibly affordable, and that is certainly one of its strong points. And this lightweight mop also uses a microfiber spin head, which makes it the perfect option for wood floors. And unlike the Mopnado, the EasyWring microfiber head is thicker and larger, allowing it to cover a bigger surface area and catch more dirt as well. As usual, you get a handle with a swiveling joint to reach all areas in your room. The mop head has a triangle shape, which is excellent for reaching into corners. The bucket is another high point of this product. It has a pedal system to activate the spin wringing. This is a neat function that makes the job faster and more efficient. You also have increased control over the amount of water that is left behind in the mop head. This is vital for the long-term durability of your wood floors. The bucket also has other neat features like a splash guard that keeps your floors as dry as possible. The O-Cedar system is compatible with the EasyWring mop refills. You can easily remove the microfiber pads for machine washing once they get dirty and grimy. The overall durability of this system is questionable, due to the affordable pricing and plastic construction. The pedal-based spinning system is especially suspect. Reports indicate that it breaks down pretty quickly, preventing you from properly drying your mop head. The telescoping handle also tends to retract and malfunction. Verdict: The EasyWring System is easy on your pocket, but you get what you pay for. If you are on a budget and want something cheap and lightweight to clean your wood floors, this is a decent option. Just don’t expect it to last too long. Hardwood floors are often the centerpiece of many homes, the pride, and joy of many a homeowner. And they require some TLC to last you a long time without wear and tear. So, frequent cleaning and mopping are highly recommended. For many of us, using a mop is boring, albeit simple chore. But when it comes to dealing with precious wood flooring, you cannot use any old mop. There is such a thing as the top mop for wood floors, and our job today is to help you find one. Check out our list of the models out there. And don’t forget to take a look at our in-depth guide to learn how to pick suitable mops for your floor. Before we explain the features you need to look for in a mop for wooden floors, we need to highlight the strengths and weaknesses of the floor in question. Wood is a fantastic option for home flooring. Natural wood has a luxurious finish that no artificial laminates can replicate. If you want your rooms to look warm and striking, a premium hardwood is the best option. And it is also much better than carpeting, especially for folks with allergies. Though not as durable as synthetic alternatives, with proper care, a hardwood floor can last several lifetimes. They will continue to look majestic even when other floors get worn down with use. Since they lack grout lines and do not attract dust and allergens like carpeting, these floors are also easier to clean. But the main challenge here is that you will have to clean them regularly, without fail. Even minor dirt, dust, and sand particles can cause damage to a wood floor in the long run. Think about the impact sandpaper has on wood. Now imagine the effect of hundreds of footsteps, with dirt particles underneath, on the wood surface. In areas that receive a high frequency of footfalls, like hallways, kitchens and dining rooms, dirt can gradually wear down the protective top layer of wood flooring. And when the top protective layer is removed, the fragile wood beneath is susceptible to heat and moisture. This can result in warping, which will need expensive repairs and renovation. The only way to avoid this kind of surface damage is through regular cleaning. But you cannot use any old method. We all know the effect that water and heat can have on wood. Just think about any old piece of wood left out to rot. So you need to be very careful about the amount of water you use to clean a wood floor. The main focus is on removing all dust and dirt particles. So a pretty comprehensive cleaning routine is required. Often, the best option is to use a vacuum with a soft, non-abrasive head, followed by cleaning with a damp (not wet) mop. If you have a steam-based cleaning system, like a steam mop, keep it away from the wooden floor! The steam will only degrade the protective covering faster. And if your floor already has some exposed wood sections, the steam and water will degrade and warp the wood in double quick time. So you need a good quality mop with some special features to deal with wood flooring. Before you start using the mop, you need to prep the floor. The best option is to use a vacuum cleaner to remove all the non-sticky dust and dirt particles. Always check the head used on the vacuum. Ensure that it is a soft, non-abrasive version specifically designed for wood surfaces. Use the lightest setting for best results. Don’t use a vacuum with a beater bar. If you don’t mind sweeping, a broom is often a better option than a vacuum cleaner. It is also one of the simplest options. Just sweep away all the dirt and dust on a regular basis. It should not be too hard since these wood floors do not attract much dirt or dust anyway. Once swept or vacuumed, the wood floor is ready for your mop. Never use a wet mop to clean a wood floor. Always wring the mop thoroughly to remove as much water as possible before applying to the wood floor. The less water you apply on a wood floor, the better. You can use a suitable wood-floor or multi-floor cleaning solution when using the mop. They can attract dust, using a static charge from nylon fibers. So they are more effective. They use less water than cotton and sponge mops, which make them perfect for wood surfaces. You can also reduce the use of chemicals with these mops.. They weigh much less than wet cotton and sponge mops. So they are ergonomic and much easier to use.. These are long-lasting fibers that can be washed for more than 500 times without showing any degradation. Cotton and sponge mops cannot survive that kind of punishment.. Even hospitals use microfiber as standard due to the ease of use, superior cleaning power, and increased productivity. These are very versatile rectangular pad-like heads that sit flat on the floor. The mop pad is either reusable (microfiber) or disposable (other materials). You can easily replace or change the mop pad for different situations, like sweeping a floor with a dust pad and then mopping it with a damp microfiber pad. These round disc-shaped mop heads are perfect for hardwood floors. They function just like the spin cycle in your washing machine when wringing to remove excess water. These are easier to manage and allow you to control just how much water gets to the floor. The top mops for wood floors often come with spin mop heads made from microfiber. Of course, you can always use a simple pail or bucket filled with water for all your mopping chores. But when dealing with wood surfaces, it might be better to look at mops that come with special buckets. With a simple pail, you don’t have much control over the wringing process. It will take you much longer to drain the excess water and make the mop head damp instead of plain wet. But special mop buckets come with wringing sections that make it easier for your clean the mop head and remove excess water. Some models also come with handy wheels that make it easier to move the bucket along the floor. If you want, you can leave aside a simple mop and bucket of water and opt for a spray mop. This is essentially a powered device, like your vacuum cleaner. The mop has a built-in canister that you can fill with water and cleaning solution. It sprays the cleaning solution through a nozzle at the mop head. This feature is manually controlled, which allows you to decide how much liquid has to be applied to the floor. Another advantage of this mop is the ability to use microfiber pads. The pads can be easily replaced or swapped as well. Taking care of your wood floors require a lot of care and attention. And you also need the mop for wood floors, armed with efficient microfiber pads. In our top four list, we have tried to include a diverse range of products. You will find simple, versatile mops, comprehensive cleaning systems, and even a powered mop with a built-in spray system. We hope you find a product that suits your budget and requirements from this list. If you have any doubts, queries, or suggestions, feel free to reach out to us in the comments section. Thank you!